Earthy and rustic with a seductive heat that lies beneath its pale jade hue...that's how I'd describe Pipián Sauce. Well, Pipián Verde, at least. 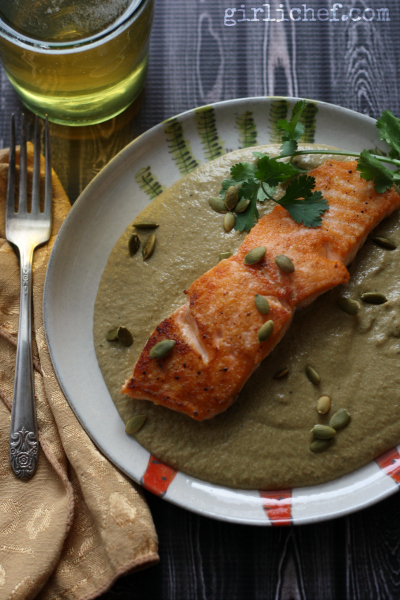 Pipián is another name for pepitas, or pumpkin seeds, which are the base and body behind this sauce. You can also switch out the green chiles and tomatillos with red chiles to make a red version. While pepitas are the ingredient typically used in pipián sauces, I've also seen versions made with sesame seeds, peanuts, almonds, or even cashews. Served with anything from fish to chicken, pork to vegetables, or smothering enchiladas, they are another National treasure of Mexico - just like mole (in my opinion). Well actually, pipián verde is also known by the name mole verde. But I think that the main difference is that, while I adore the simplicity of a pipián, the complexity of a mole takes your tastebuds up to a whole 'nother level! Mole builds flavors from the addition of even more spices, nuts, dried fruits, and other flavor additions (like this Mole Verde Queretano). You may have guessed by now that Leslie and I chose Pipián as our she made, ella hace theme this month. 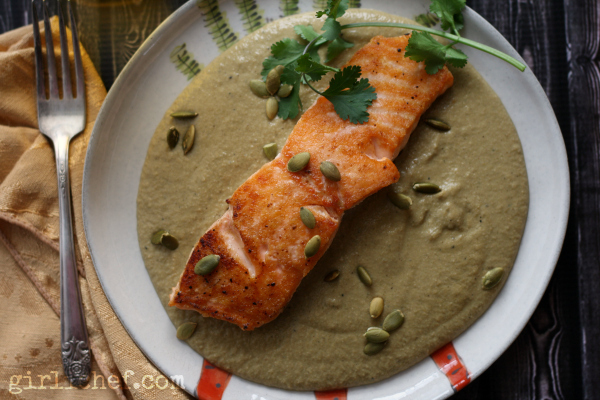 I was in the mood for fish (what's new), so this golden-seared salmon sitting atop a puddle of silky, beckoningingly green sauce is what I chose to share today. What's really awesome is that Leslie chose to make a Chicken Pipián Rojo, so you get to see both variations today! 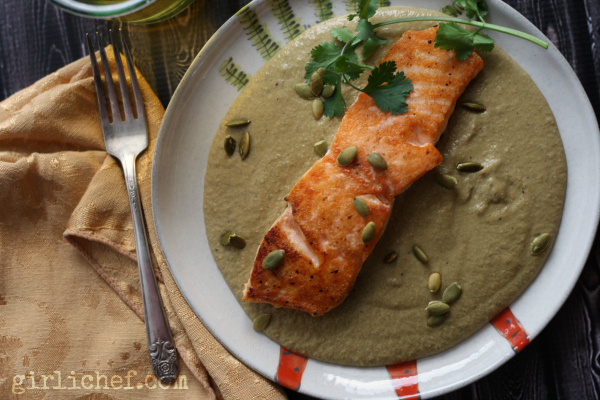 Seared salmon sitting atop a silky, jade-green puddle of earthy, rustic Pipián Verde sauce. Preheat the broiler. Put the tomatillos, serranos, onion, and garlic on a foil-lined tray under broiler, turning as needed, until charred, 10-12 minutes. The onion and garlic will be done first; add everything to the jar of a blender as it is finished, including any juices from the tray. Heat the oil in a large, deep-sided pan. Once hot, pour in the mixture from the blender (don't rinse the blender yet, you'll need it again). Cook and stir until it thickens to the consistency of tomato paste, 6-8 minutes. Add stock, pepitas, anise seeds, and cilantro (just rip it a couple of times and drop it in); bring to a boil. Cover partially, and reduce to a slow but steady simmer for 30 minutes. Pour into the blender jar and puree until smooth (in batches, if necessary); if you have measuring lines on your blender, you should have about 3 cups of sauce. Add a bit more stock or water to make 3 cups, if needed. If you have more, don't worry, you can cook it down a little once you've put it back in the pan. Wipe out the pan, then set a medium-mesh strainer over the top of it. Pour the sauce through the strainer, pushing it through with a rubber spatula. Taste and season with salt and pepper - but DO taste first; depending on the stock/broth you used, it may be salty enough already. If using stir in the heavy cream. Set aside while you make the fish. If using skin-on salmon, score the skin a few times to keep it from curling. Heat a tablespoon or so of oil in the bottom of a large cast-iron (or other heavy non-stick) skillet. Season the salmon fillets with salt, white pepper, and ground anise, if using. Lay the salmon into the extremely hot skillet, top side down (or skin side down if using skin-on). Sear for 4-5 minutes, or until a nice golden crust forms (or the skin is crisp). Flip and cook for another 2-3 minutes, or until done to your liking. To serve, ladle a large scoop of warm sauce on to a deep plate and set the fish in the center (skin side up, if using skin-on). Sprinkle with some extra pepitas, if you wish. Serve with white rice, garlicky greens, and/or some crusty bread. Since the sauce has a nice underlying heat, it's fantastic enjoyed alongside a cold beer (a lighter one)! You could use fish or chicken stock, or even water, in place of the vegetable stock if you need to. 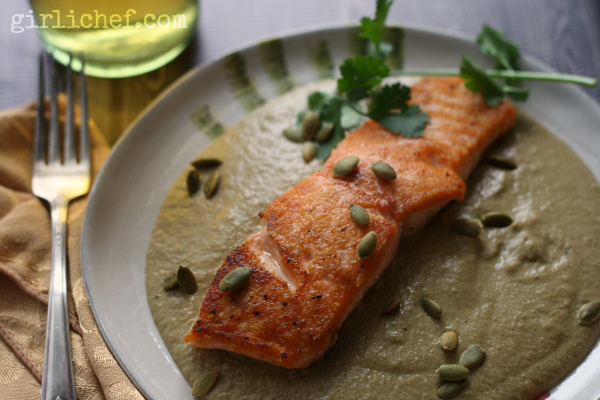 This Pipián sauce is also fantastic with white fish, pork, or chicken. What happens when two American girls who are both married to Mexican guys find out that although one of them lives in the U.S. and one of them lives in Mexico, they both love eating the same food? Well, naturally they decide to get "together" the only way they can and cook up the same dishes. Or perhaps take the same ingredients and talking about them in their own voice or using them in their own way. Leslie and I have teamed up to occasionally cook/bake/make a our own versions of the same food. We want to see how similar (or how different) they turn out. Other times we will pick an ingredient and use it however we choose...or maybe just talk about it. Good food knows no borders and we hope to share the food we love with you. It's not a competition, it's a showcase. We will post on the same day as each other and would love to hear your thoughts on what we've made and how you make it. Join me (here at All Roads Lead to the Kitchen) and Leslie in her kitchen (at La Cocina de Leslie) for some delicious food.